TRITAN #50 Hubless Bushed Sprockets For Roller Chain Are Used For Vehicle Transmissions, Conveyor Belts Or Other Industrial Machinery And Mechanical Applications. TRITAN #50 Hubless Bushed Sprockets For Roller Chain are made of heavy duty forged steel with black oxide finish for resistance to corrosion and long lasting durability and dependability. Teeth are hardened to provide extra wear life, extending chain life and saving on downtime and replacement cost.Hubless 5/8 inch pitch sprockets with12 to 60 teeth are available inQD Bushed (Quick Disconnect) or TL Bushed (Tapered) bore types. TRITAN #60 Bushed Sprockets For Roller Chain Are Used For Vehicle Transmissions, Conveyor Belts Or Other Industrial Machinery And Mechanical Applications. TRITAN #60 Bushed Sprockets For Roller Chain are made of heavy duty forged steel with black oxide finish for resistance to corrosion and long lasting durability and dependability. Teeth are hardened to provide extra wear life, extending chain life and saving on downtime and replacement cost. 3/4 inch pitch sprockets with11 to 48 teeth are available inQD Bushed (Quick Disconnect) or TL Bushed (Tapered) bore types. TRITAN #80 Hubless Bushed Sprockets For Roller Chain Are Used For Vehicle Transmissions, Conveyor Belts Or Other Industrial Machinery And Mechanical Applications. TRITAN #80 Hubless Bushed Sprockets For Roller Chain are made of heavy duty forged steel with black oxide finish for resistance to corrosion and long lasting durability and dependability. Teeth are hardened to provide extra wear life, extending chain life and saving on downtime and replacement cost.Hubless 1 inch pitch sprockets with10 to 60 teeth are available inQD Bushed (Quick Disconnect) or TL Bushed (Tapered) bore types. TRITAN #100 Bushed Sprockets For Roller Chain Are Used For Vehicle Transmissions, Conveyor Belts Or Other Industrial Machinery And Mechanical Applications. TRITAN #100 Bushed Sprockets For Roller Chain are made of heavy duty forged steel with black oxide finish for resistance to corrosion and long lasting durability. Teeth are hardened to provide extra wear life, extending chain life and saving on downtime and replacement cost. Include recessed grooves in hub for chain clearance. 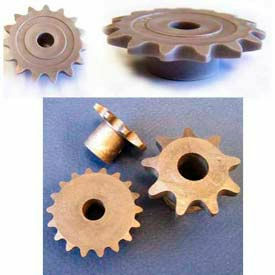 Sprockets with 11 to 42 teeth are available in QD Bushed (Quick Disconnect) or TL Bushed (Tapered) bore types. TRITAN #120 Bushed Sprockets For Roller Chain Are Used For Vehicle Transmissions, Conveyor Belts Or Other Industrial Machinery And Mechanical Applications. TRITAN #120 Bushed Sprockets For Roller Chain are made of heavy duty forged steel with black oxide finish for resistance to corrosion and long lasting durability and dependability. Teeth are hardened to provide extra wear life, extending chain life and saving on downtime and replacement cost. 1-1/2 inch pitch sprockets with12 to 36 teeth are available inQD Bushed (Quick Disconnect) or TL Bushed (Tapered) bore types. TRITAN #35 Bushed Sprockets For Roller Chain Are Used For Vehicle Transmissions, Conveyor Belts Or Other Industrial Machinery And Mechanical Applications. TRITAN #35 Bushed Sprockets For Roller Chain are made of heavy duty forged steel with black oxide finish for resistance to corrosion and long lasting durability and dependability. Teeth are hardened to provide extra wear life, extending chain life and saving on downtime and replacement cost. 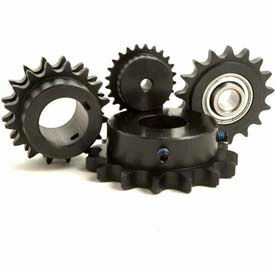 3/8 inch pitch, QD Bushed (Quick Disconnect) sprockets are available with30, 40 or 48 teeth. TRITAN #40 Hubless Bushed Sprockets For Roller Chain Are Used For Vehicle Transmissions, Conveyor Belts Or Other Industrial Machinery And Mechanical Applications. TRITAN #40 Hubless Bushed Sprockets For Roller Chain are made of heavy duty forged steel with black oxide finish for resistance to corrosion and long lasting durability and dependability. Teeth are hardened to provide extra wear life, extending chain life and saving on downtime and replacement cost.Hubless 1/2 inch pitch sprockets with14 to 72 teeth are available inQD Bushed (Quick Disconnect) or TL Bushed (Tapered) bore types. Plastock® Roller Chain Sprockets Are Used For A Variety Of Power Transmission Applications. Plastock® Roller Chain Sprockets are made of injection molded sprockets manufactured of nylatron GS51 material. Available with varying numbers of teeth, hub sizes and stock bore sizes to meet job requirements. Available sizes are 25, 35 and 40B. Number of teeth are from 9 to 60. Pitch diameters are from 0.809 in. to 5.376 in.. Available in a variety of outer diameters and lengths.